I bought this snowglobe from West Elm as a birthday present for my stepmother-in-law, who was in town for the weekend with Adam’s family. Her birthday was yesterday, and we gave this to her. But I’m kind of obsessed with it and want one for myself. 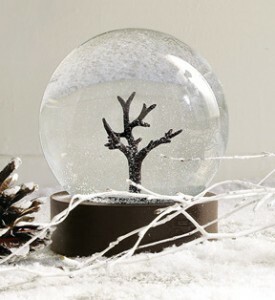 I just think it’s incredibly chic and whimsical, and even though I’ve never gotten behind the whole snowglobe movement I think this is the perfect winter decoration. I may have to get one myself.